Support. A wide range of pedestrians might be affected by TTC zones, including the young, elderly, and people with disabilities such as hearing, visual, or mobility. These pedestrians need a clearly delineated and usable travel path. Considerations for pedestrians with disabilities are addressed in EPG 616.4.2 Accessibility Considerations. Standard. The various TTC provisions for pedestrian and worker safety set forth in EPG 616 shall be applied by knowledgeable (for example, trained and/or certified) persons after appropriate evaluation and engineering judgment. Advance notification of sidewalk closures shall be provided by the maintaining agency. If the TTC zone affects the movement of pedestrians, adequate pedestrian access and walkways shall be provided. If the TTC zone affects an accessible and detectable pedestrian facility, the accessibility and detectability shall be maintained along the alternate pedestrian route. Option. If establishing or maintaining an alternate pedestrian route is not feasible during the project, an alternate means of providing for pedestrians may be used, such as adding free bus service around the project or assigning someone the responsibility to assist pedestrians with disabilities through the project limits. Support. It must be recognized that pedestrians are reluctant to retrace their steps to a prior intersection for a crossing or to add distance or out-of-the-way travel to a destination. A.	Pedestrians should not be led into conflicts with vehicles, equipment and operations. B.	Pedestrians should not be led into conflicts with vehicles moving through or around the worksite. C.	Pedestrians should be provided with a convenient and accessible path that replicates as nearly as practical the most desirable characteristics of the existing sidewalk(s) or footpath(s). A pedestrian route should not be severed and/or moved for non-construction activities such as parking for vehicles and equipment. Consideration should be made to separate pedestrian movements from both worksite activity and vehicular traffic. Unless an acceptable route that does not involve crossing the roadway can be provided, pedestrians should be appropriately directed with advance signing that encourages them to cross to the opposite side of the roadway. In urban and suburban areas with high vehicular traffic volumes, these signs should be placed at intersections (rather than midblock locations) so that pedestrians are not confronted with midblock worksites that will induce them to attempt skirting the worksite or making a midblock crossing. Support. Figs. 616.8.28 - MT and 616.8.29 - MT show typical TTC device usage and techniques for pedestrian movement through work zones. Additional guidance for pedestrian movement through work zones are located in EPG 616.24 Traffic Control for Non-Motorized Traffic. A. Provisions for continuity of accessible paths for pedestrians should be incorporated into the TTC plan. B. Access to transit stops should be maintained. C.	A smooth, continuous hard surface should be provided throughout the entire length of the temporary pedestrian facility. There should be no curbs or abrupt changes in grade or terrain that could cause tripping or be a barrier to wheelchair use. The geometry and alignment of the facility should meet the applicable requirements of the “Americans with Disabilities Act Accessibility Guidelines for Buildings and Facilities (ADAAG)” (see EPG 900.1.11). D.	The width of the existing pedestrian facility should be provided for the temporary facility if practical. Traffic control devices and other construction materials and features should not intrude into the usable width of the sidewalk, temporary pathway, or other pedestrian facility. When it is not possible to maintain a minimum width of 60 in. throughout the entire length of the pedestrian pathway, a 60 in. x 60 in. passing space should be provided at least every 200 ft. to allow individuals in wheelchairs to pass. E.	Blocked routes, alternate crossings, and sign and signal information should be communicated to pedestrians with visual disabilities by providing devices such as audible information devices, accessible pedestrian signals, or barriers and channelizing devices that are detectable to the pedestrians traveling with the aid of a long cane or who have low vision. Where pedestrian traffic is detoured to a TTC signal, engineering judgment should be used to determine if pedestrian signals or accessible pedestrian signals should be considered for crossings along an alternate route. F.	When channelization is used to delineate a pedestrian pathway, a continuous detectable edging should be provided throughout the length of the facility so that pedestrians using a long cane can follow it. These detectable edgings should comply with the provisions of EPG 616.6.74. G.	Signs and other devices mounted lower than 7 ft. above the temporary pedestrian pathway should not project more than 4 in. into accessible pedestrian facilities. Option. Whenever it is feasible, closing off the worksite from pedestrian intrusion may be preferable to channelizing pedestrian traffic along the site with TTC devices. Guidance. Fencing should not create sight distance restrictions for road users. Fences should not be constructed of materials that would be hazardous if impacted by vehicles. Wooden railing, fencing, and similar systems placed immediately adjacent to motor vehicle traffic should not be used as substitutes for crashworthy temporary traffic barriers. Ballast for TTC devices should be kept to the minimum amount needed and should be mounted low to prevent penetration of the vehicle windshield. Movement by work vehicles and equipment across designated pedestrian paths should be minimized and, when necessary, should be controlled by flaggers or TTC. Staging or stopping of work vehicles or equipment along the side of pedestrian paths should be avoided, since it encourages movement of workers, equipment, and materials across the pedestrian path. Access to the work space by workers and equipment across pedestrian walkways should be minimized because the access often creates unacceptable changes in grade, and rough or muddy terrain, and pedestrians will tend to avoid these areas by attempting non-intersection crossings where no curb ramps are available. Option. A canopied walkway may be used to protect pedestrians from falling debris, and to provide a covered passage for pedestrians. Guidance. Covered walkways should be sturdily constructed and adequately lighted for nighttime use. When pedestrian and vehicle paths are rerouted to a closer proximity to each other, consideration should be given to separating them by a temporary traffic barrier. If a temporary traffic barrier is used to shield pedestrians, it should be designed to accommodate site conditions. Support. Depending on the possible vehicular speed and angle of impact, temporary traffic barriers might deflect upon impact by an errant vehicle. Guidance for locating and designing temporary traffic barriers can be found in Chapter 9 of AASHTO’s Roadside Design Guide (see EPG 900.1.11). Standard. Short intermittent segments of temporary traffic barrier shall not be used because they nullify the containment and redirective capabilities of the temporary traffic barrier, increase the potential for serious injury both to vehicle occupants and pedestrians, and encourage the presence of blunt, leading ends. All upstream leading ends that are present shall be appropriately flared or protected with properly installed and maintained crashworthy cushions. Adjacent temporary traffic barrier segments shall be properly connected in order to provide the overall strength required for the temporary traffic barrier to perform properly. Normal vertical curbing shall not be used as a substitute for temporary traffic barriers when temporary traffic barriers are needed. Option. Temporary traffic barriers or longitudinal channelizing devices may be used to discourage pedestrians from unauthorized movements into the work space. They may also be used to inhibit conflicts with vehicular traffic by minimizing the possibility of midblock crossings. Support. A major concern for pedestrians is urban and suburban building construction encroaching onto the contiguous sidewalks, which forces pedestrians off the curb into direct conflict with moving vehicles. Guidance. If a significant potential exists for vehicle incursions into the pedestrian path, pedestrians should be rerouted or temporary traffic barriers should be installed. Support. TTC devices, jersey barriers, and wood or chain link fencing with a continuous detectable edging can satisfactorily delineate a pedestrian path. Guidance. Tape, rope, or plastic chain strung between devices are not detectable, do not comply with the design standards in the Americans with Disabilities Act Accessibility Guidelines for Buildings and Facilities (ADAAG) (see EPG 900.1.11), and should not be used as a control for pedestrian movements. In general, pedestrian routes should be preserved in urban and commercial suburban areas. Alternative routing should be discouraged. The highway agency in charge of the TTC zone should regularly inspect the activity area so that effective pedestrian TTC is maintained. Support. Additional information on the design and construction of accessible temporary facilities is found in publications listed in EPG 900.1.11 (see Publications nos. 12, 38, 39 and 42). Guidance. The extent of pedestrian needs should be determined through engineering judgment or by the individual responsible for each TTC zone situation. Adequate provisions should be made for pedestrians with disabilities. Standard. When existing pedestrian facilities are disrupted, closed, or relocated in a TTC zone, the temporary facilities shall be detectable and include accessibility features consistent with the features present in the existing pedestrian facility. Where pedestrians with visual disabilities normally use the closed sidewalk, a barrier that is detectable by a person with a visual disability traveling with the aid of a long cane shall be placed across the full width of the closed sidewalk. Support. Maintaining a detectable, channelized pedestrian route is much more useful to pedestrians who have visual disabilities than closing a walkway and providing audible directions to an alternate route involving additional crossings and a return to the original route. Braille is not useful in conveying such information because it is difficult to find. Audible instructions might be provided, but the extra distance and additional street crossings might add complexity to a trip. Guidance. Because printed signs and surface delineation are not usable by pedestrians with visual disabilities, blocked routes, alternate crossings, and sign and signal information should be communicated to pedestrians with visual disabilities by providing audible information devices, accessible pedestrian signals, and barriers and channelizing devices that are detectable to pedestrians traveling with the aid of a long cane or who have low vision. Support. The most desirable way to provide information to pedestrians with visual disabilities that is equivalent to visual signing for notification of sidewalk closures is a speech message provided by an audible information device. Devices that provide speech messages in response to passive pedestrian actuation are the most desirable. Other devices that continuously emit a message, or that emit a message in response to use of a pushbutton, are also acceptable. Signing information can also be transmitted to personal receivers, but currently such receivers are not likely to be carried or used by pedestrians with visual disabilities in TTC zones. Audible information devices might not be needed if detectable channelizing devices make an alternate route of travel evident to pedestrians with visual disabilities. Guidance. If a pushbutton is used to provide equivalent TTC information to pedestrians with visual disabilities, the pushbutton should be equipped with a locator tone to notify pedestrians with visual disabilities that a special accommodation is available, and to help them locate the pushbutton. Support. Equally as important as the safety of road users traveling through the TTC zone is the safety of workers. TTC zones present temporary and constantly changing conditions that are unexpected by the road user. This creates an even higher degree of vulnerability for workers on or near the roadway. Maintaining TTC zones with road user flow inhibited as little as possible, and using TTC devices that get the road user’s attention and provide positive direction are of particular importance. Likewise, equipment and vehicles moving within the activity area create a risk to workers on foot. When possible, the separation of moving equipment and construction vehicles from workers on foot provides the operator of these vehicles with a greater separation clearance and improved sight lines to minimize exposure to the hazards of moving vehicles and equipment. A. Training — all workers should be trained on how to work next to motor vehicle traffic in a way that minimizes their vulnerability. Workers having specific TTC responsibilities should be trained in TTC techniques, device usage, and placement. B. Temporary Traffic Barriers — temporary traffic barriers should be placed along the work space depending on factors such as lateral clearance of workers from adjacent traffic, speed of traffic, duration and type of operations, time of day, and volume of traffic. C.	Speed Reduction — reducing the speed of vehicular traffic, mainly through regulatory speed zoning, funneling, lane reduction, or the use of uniformed law enforcement officers or flaggers, should be considered. D.	Activity Area — planning the internal work activity area to minimize backing-up maneuvers of construction vehicles should be considered to minimize the exposure to risk. E.	Worker Safety Planning — a trained person designated by the employer should conduct a basic hazard assessment for the worksite and job classifications required in the activity area. This safety professional should determine whether engineering, administrative, or personal protection measures should be implemented. This plan should be in accordance with the Occupational Safety and Health Act of 1970, as amended, “General Duty Clause” Section 5(a)(1) - Public Law 91-596, 84 Stat. 1590, December 29, 1970, as amended, and with the requirement to assess worker risk exposures for each job site and job classification, as per 29 CFR 1926.20 (b)(2) of Occupational Safety and Health Administration Regulations, General Safety and Health Provisions (see EPG 900.1.11). Daytime Flagger. During daytime activities, flaggers shall wear a high visibility hard hat, safety glasses, a Performance Class 3 top OR a Performance Class 2 top, and safety footwear. Hard hats other than high visibility orange or green shall be covered with a high visibility covering. Daytime Worker. During daytime activities, workers shall wear a hard hat, safety glasses, a Performance Class 3 top OR a Performance Class 2 top, and safety footwear. Nighttime Flagger. During nighttime activities, flaggers shall wear a high visibility/reflective hard hat, safety glasses, a Performance Class 3 top AND Class E bottoms, OR Performance Class 2 top AND Class E bottoms, and safety footwear. Hard hats shall be reflective or covered with a high visibility covering. Nighttime Worker. During nighttime activities, workers shall wear a hard hat, safety glasses, a Performance Class 3 top OR Performance Class 2 top AND Class E bottoms, and safety footwear. See also EPG 616.5.2 High-Visibility Safety Apparel and Sec 107.4. A graphical representation of personal protective equipment is available. Standard. All workers, including emergency responders, within the right-of-way who are exposed either to traffic (vehicles using the highway for purposes of travel) or to work vehicles and construction equipment within the TTC zone shall wear high-visibility safety apparel that meets the Performance Class 2 or 3 requirements of the ANSI/ISEA 107–2004 publication entitled American National Standard for High-Visibility Safety Apparel and Headwear (see EPG 900.1.11), or equivalent revisions, and labeled as meeting the ANSI 107-2004 standard performance for Class 2 or 3 risk exposure, except as provided in the below option. A person designated by the employer to be responsible for worker safety shall make the selection of the appropriate class of garment. Option. Emergency and incident responders and law enforcement personnel within the TTC zone may wear high-visibility safety apparel that meets the performance requirements of the ANSI/ISEA 207-2006 publication entitled American National Standard for High-Visibility Public Safety Vests (see EPG 900.1.11), or equivalent revisions, and labeled as ANSI 207-2006, in lieu of ANSI/ISEA 107-2004 apparel. Standard. When uniformed law enforcement personnel are used to direct traffic, to investigate crashes, or to handle lane closures, obstructed roadways, and disasters, high-visibility safety apparel as described in this Section shall be worn by the law enforcement personnel. Except as provided in the below option, firefighters or other emergency responders working within the right-of-way shall wear high-visibility safety apparel as described in this article. Option. Firefighters or other emergency responders working within the right of way and engaged in emergency operations that directly expose them to flame, fire, heat, and/or hazardous materials may wear retroreflective turn-out gear that is specified and regulated by other organizations, such as the National Fire Protection Association. A. 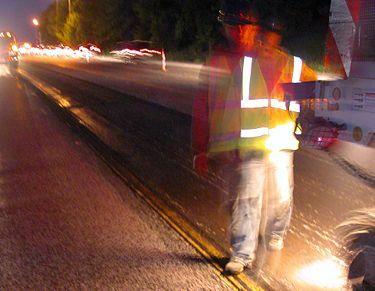 Shadow Vehicle—in the case of mobile and constantly moving operations, such as pothole patching and striping operations, a shadow vehicle, equipped with appropriate lights and warning signs, may be used to protect the workers from impacts by errant vehicles. The shadow vehicle may be equipped with a rear-mounted impact attenuator. B. Road Closure—if alternate routes are available to handle road users, the road may be closed temporarily. This may also facilitate project completion and thus further reduce worker vulnerability. C.	Law Enforcement Use—in highly vulnerable work situations, particularly those of relatively short duration, law enforcement units may be stationed to heighten the awareness of passing vehicular traffic and to improve safety through the TTC zone. D.	Lighting—for nighttime work, the TTC zone and approaches may be lighted. E.	Special Devices—these include rumble strips, changeable message signs, hazard identification beacons, flags, and warning lights. Intrusion warning devices may be used to alert workers to the approach of errant vehicles. Support. Judicious use of the special devices described in Item E, above, might be helpful for certain difficult TTC situations, but misuse or overuse of special devices or techniques might lessen their effectiveness. This page was last modified on 29 August 2017, at 08:23.